This recipe for homemade Chunky Beef Stew is the perfect cool weather comfort food packed full of veggies and hunks of tender beef. When the cool weather finally decides to roll in here in Florida, I take advantage of every chilly day I can by making some good old comfort food. 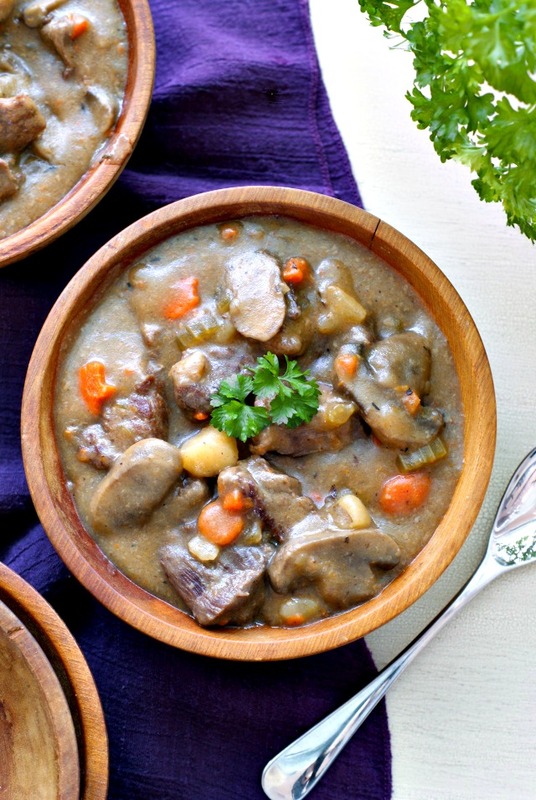 A nice hearty beef stew just screams cool weather confort food, don't you think?! My first instict when I made this delish stew was to prepare it in the crock pot. I am a serious crock pot fan and I knew that it would make the hunks of stew meat melt in your mouth tender. Unfortunately it was too late in the day to make a crock pot meal, so I went the stove top route. I am happy to reprt that the meat was cooked to perfection! The rich beef stock-based broth was the perfect vessel for the hunky potatoes, carrots, and mushrooms. If you've been looking for the perfect recipe to 'stick to your ribs' this fall, I know you'll love this hearty beef stew! Heat the oil in a medium stock pot over medium high heat. Place the beef into a bowl, season with the salt, and toss with flour until all pieces are coasted. Brown the beef (in batches) in the hot oil. Return all of the beef to the pot. Add the vegetables and stir frequently with a wooden spoon, scraping the bottom of the pan. The vegetables will begin releasing moisture and you'll be able to scrape the browned bits off of the bottom. Continue to cook for 3 minutes, or until the onions are soft. Add the stock, rosemary, and thyme to the pan and scrape any brown bits left on the bottom of the pan. Bring to a boil. Reduce the heat to medium low, cover, and cook for 50-60 minutes, stirring often, or until the beef is tender. If you want a thicker stew, make a a slurry with the cornstarch and water and add to the pot. Stir until thickened just a bit.